Twin-Twin Transfusion Syndrome (TTTS) is a rare condition that happens in pregnancies with monochorionic twins, or twins who share a single placenta. Typically, the mother’s placenta delivers blood and nutrition to the fetuses equally. With TTTS, the mother’s placenta favors blood flow to one fetus, called the “recipient.” This fetus takes on too much volume, produces too much urine, and ultimately can develop heart failure. The imbalance causes the other, or “donor” fetus, to be more dehydrated, urinate less and grow at a slower rate. About one third of twins are monochorionic and about 15 percent of those will develop TTTS. Our doctors diagnose TTTS using ultrasound and Doppler studies that measure the blood flow of both fetuses. If TTTS is found, doctors perform an echocardiogram to measure blood flow and heart function. If TTTS is found after the ultrasound, we will determine the severity of the condition. We use the Quintero and Cincinnati staging systems to assess TTTS cases. Stage I: Uneven volume of amniotic fluid. Stage II: The bladder of the donor fetus is empty and it cannot be found using ultrasound. Stage III: Abnormal blood flow through the umbilical cord and placenta; it is identified using Doppler ultrasound. Stage IV: One or both fetuses retain fluid, causing hydrops, or swelling, inside the womb. Stage V: The loss of one or both twins. The additional staging system, which was created by Cincinnati Fetal Care where Dr. Stephenson trained, includes information about heart function. Based on the findings of mild, moderate, or severe heart failure, the patient may also be staged as 3A, 3B, or 3C. The treatment plan will depend on the severity of TTTS and how far along you are in your pregnancy. After the ultrasound evaluation, our fetal surgery team will meet with the family to answer questions and address concerns. The treatment plan will be laid out clearly so the family and referring physician know what to expect. In less severe cases of TTTS, the fetuses will be watched closely using ultrasound and echocardiogram to find out if the condition is getting better or worse. This selective fetoscopic laser ablation procedure (SFLP) uses a small camera to locate the “abnormal vessels” inside the uterus. The laser energy is used to stop the transfer of blood between fetuses, and the procedure can reverse the effects of TTTS. Umbilical cord occlusion is a procedure used to temporarily stop the blood supply to an abnormal identical twin of a monochorionic pregnancy. This treatment generally is used for extreme cases in which one fetus has a life-threatening defect in addition to TTTS. Selective fetoscopic laser photocoagulation (SFLP) is used for more severe cases of TTTS that occur early in pregnancy. This procedure is done in the operating room, generally with epidural anesthesia (through a shot in the lower back). Then, through a small skin incision, a camera travels through the uterus to map and identify the placental vessels. Next, a laser is used to correct uneven blood flow. 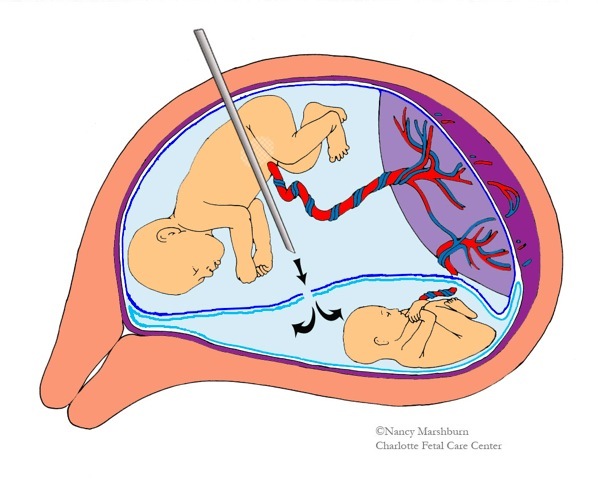 With “selective” procedures only the abnormal vessels are cauterized or ablated and the normal vessels are left alone to preserve the maximum placental function. In addition to laser surgery, a septostomy procedure also may be suggested. Using a laser guided by ultrasound, surgeons make a small hole in the membrane that separates the two fetuses. The goal is to balance amniotic fluid pressure and circulation of the placenta. Usually you’ll be observed in the hospital for a day and then have a follow up ultrasound within a week. We work closely with your maternal-fetal medicine specialist to create a care plan following your operation. As with any procedure, there are risks, benefits and alternative treatment options. Discuss and weigh the risks and benefits of any procedure carefully. Our experts will explain your options, so you can make the best choices for your unborn babies. Our fetal care team will provide a comprehensive fetal care consultation and discuss all the options available to help you and your family make an informed decision. Our center offers TTTS consultations no matter how far along you are in your pregnancy. Surgery can be an option as early as 16 weeks and up to 26 weeks. We operate on many of the most difficult cases, such as anterior placentas, where the placenta is located on the front of the uterus, and advanced stages of intrauterine growth restriction, where an unborn baby doesn’t grow at a normal rate inside the womb. We also observe milder cases. We offer medical treatment to help fetuses with chronic heart disease as an extra therapy to help improve heart function. We recognize the emotional challenges you face. That’s why we take a team approach to offer care and support throughout your pregnancy. To learn more, or to refer a patient, call Charlotte Fetal Care Center at 877-899-2322.